Are you a member of a quilt guild? I’m a member of several! Why do I ask? I think joining a guild can expand your knowledge of quilting and a great way to meet like minded people! And most guilds have workshops. (Don’t forget you local quilt shops for workshops/classes!) Even as a teacher, I still take classes. I like hanging out with my quilting friends and there is always something I can take away from class. One of the local guilds I belong to held a workshop last Saturday with Linda Warren using her “The Learning Curve” ruler. OH MY! What an awesome tool! Linda’s website is www.LindaWarrenDesigns.com. I bring up workshops, classes and tools because there are many different way to get to the same end in quilting. Find the way that best suits YOUR thought process! There you have tip #1! Tip #1 – Use the quilting method that best suites YOU! Linda’s class was all about curved piecing. Sure, we could cut our shapes the exact size and sew them together but that can be challenging to end up with everything the same size. Linda has you cut larger pieces and use her brilliant tool to cut every finished piece the SAME! 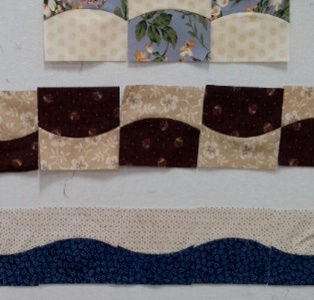 See some of the border ideas we played with in class are below. Thanks Linda! One of my philosophies is to use tools suited for the job. As an example, don’t cut a 2 1/2″ square with a 6″ x 24″ ruler. Sure, use the larger ruler to cut strips but go to a smaller ruler to sub cut. Tool designers make tools to make things easier! That is why I designed Brilliant Bindings. I took all the lines from a “regular” ruler that I use for bindings and put it in one place! Tip #2 – Use the best tool for the job at hand. Enjoy finding new tools (or new tools to you). You can find Brilliant Bindings on my website, www.wendtquilting.com. 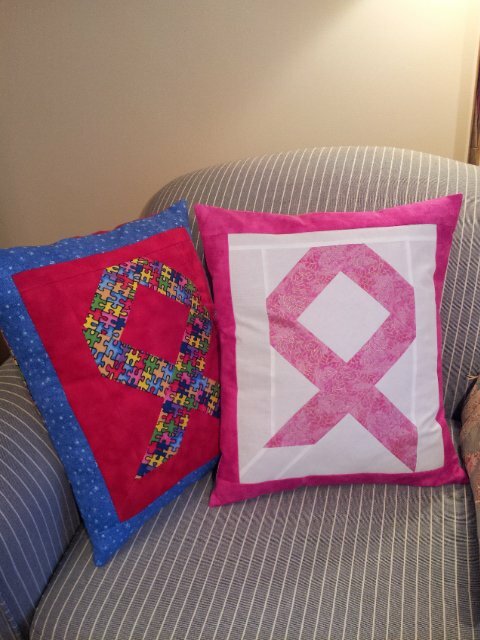 Be sure to go to “Free Patterns” for the Brilliant Ribbon Pillow using the Brilliant Bindings tool as a the template. This entry was posted in Brilliant Bindings, Tips, Tools, Uncategorized. Bookmark the permalink.